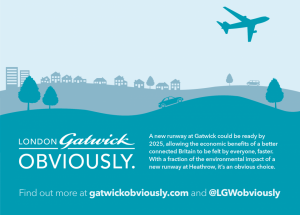 Plane Stupid posters mocking Gatwick's new "obviously" advertising campaign (see below) have started appearing on the tube network across London this morning. Plane Stupid members were out from the early hours of this morning placing at least 300 posters across the London Underground train network. 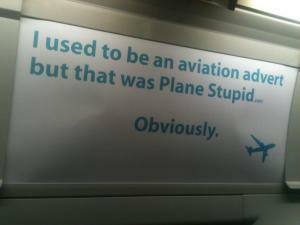 "I used to be an aviation advert. But that was Plane Stupid. Obviously". This mornings subvertising effort was done in opposition to a recent Gatwick advertising campaign called "Gatwick Obviously" which is desperately trying to make the case for expansion of Gatwick Airport instead of at Heathrow or the Thames Estuary. "Airport expansion is not the right answer in a time of climate crisis; at Gatwick, Heathrow or anywhere else. What the aviation industry has managed to do, partly through it's excessive spending on advertising, is to hijack the debate to make it appear that the only thing up for debate is where a new runway will go. "When actually, the facts show that we cannot have any airport expansion if we want to meet our climate change reduction targets at the same time. When you add in the noise problems, air pollution and community blight caused by airport expansion then the case for expansion falls apart as it did before in 2010". Shutting down an airport. Officially. Legally. For good. It sounds like the impossible dream. Wild. Impracticable. Impossible in this day and age. It sounds even more ridiculous to claim that it will benefit the economy. Yet that is exactly what a new report published today by the New Economics Foundation (NEF) claims will happen if London City Airport closes. Royal Docks Revival: Replacing City Airport, commissioned by the campaign group HACAN East, shows that, if City Airport were shut down, the land freed up would be able to cater for businesses which produced many more jobs and created a lot more income than the airport does. The stats are convincing. City Airport contributes £750 million each year to the UK economy. The nearby Excel Centre, which occupies roughly the same amount of space as the airport, contributes £1.3 billion. City Airport employs the equivalent of 1,900 full-time jobs. The proposed Silvertown Quays development, just along the road, estimates it will employ 9,000. Even if that turns out to be an overestimate, the difference remains huge. But the report’s emphasis is more about replacing the airport with community-run businesses rather than with more big corporations. The closure of London City would not add to the pressure to expand Heathrow or any other London Airport. City only accounts for 2.4% of the traffic at the London airports, easily absorbed by the other airports. Currently the airport messes up the local community with noise and air pollution. 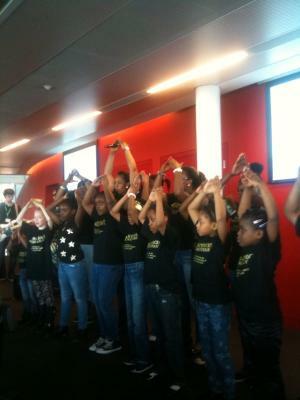 The local choir who sang at the launch said they couldn’t perform outside because of the noise of the planes. 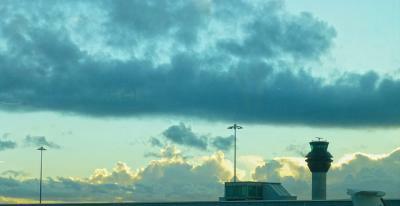 The airport also contributes to CO2 emissions. What could be cooler than closing it down. This report shows that would also benefit the economy. HACAN (Heathrow Association for Control of Aircraft Noise) and Zac Goldsmith MP have announced today a new video competition against expansion of Heathrow Airport. The project is called 'No Ifs, No Buts' in reference to David Cameron's promise before the last election to rule out expansion at Heathrow. "Yet within 30 months of taking power he set up a commission to look again at the question of a new runway" the website says. 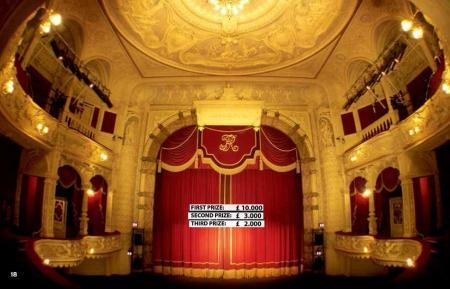 “The competition is open to absolutely everyone, and will be judged on the night by a high profile panel, as well as the audience itself. Among the submissions, I’m looking for some really powerful messages that will be taken up on social and conventional media, and ram home the message that Heathrow expansion is not only the wrong solution for our economy, it is politically undeliverable."